Jane Gaze -Sculpture by a Scottish artist inspired by the historic lead mines around Strontian, using lead and strontium carbonate. Sited at the head of Loch Sunart Strontian is one of the few places in the world to have an element named after it. Strontianite was first identified in one of the lead mines there in the late 19th Century. At their peak the mines were the major source of lead in Scotland and were manned by a largely itinerant workforce. This piece of work was made as homage to the lead miners; it was inspired by the story that during the Napoleonic War, French prisoners were used as enforced labour to meet the demand for lead for munitions. The oak wreath refers to the use of timber from the ancient oak woods as a source of fuel to make charcoal to smelt the lead. 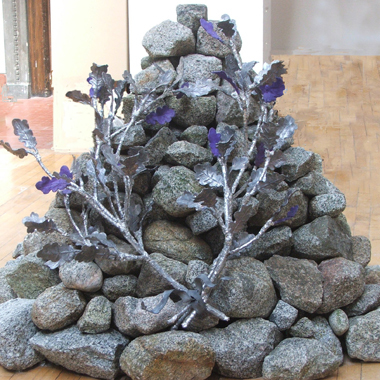 The ceramic oak leaves are decorated with a vivid purple strontium carbonate glaze; the cairn is made from granite from Strontian.